A great example of a London home restored to it’s original splendor by using Tudor Roof Tile’s Rural Grey colour. Check out this latest issue of @rrnews_social! Tudor’s friends at Whites Roofing in Risbury, Herefordshire have stepped up to the challenge. Using Tudor’s Arris Hips, they have now completed the turret on a private dwelling in Shropshire. 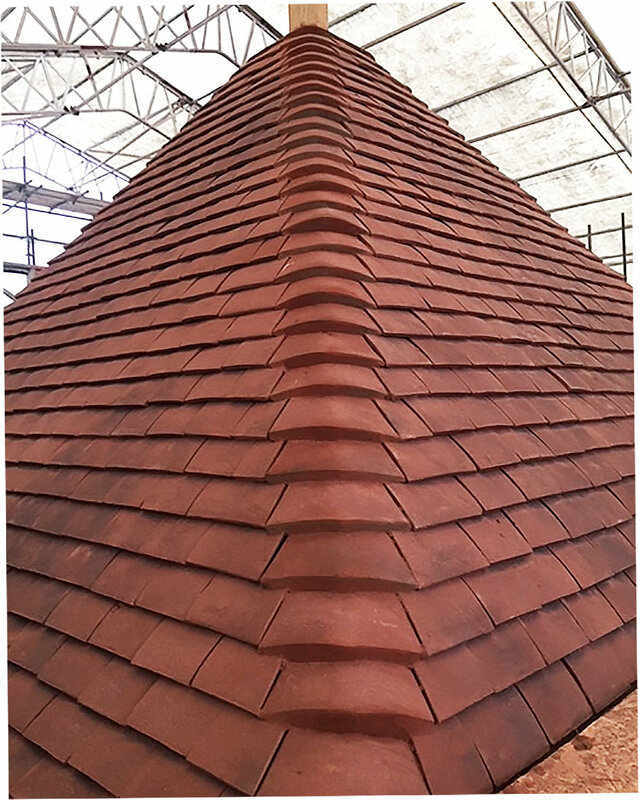 Combining the aesthetic features of Tudor’s roof tiles, with the excellent skills of Whites craftsmen, the effect is stunning. 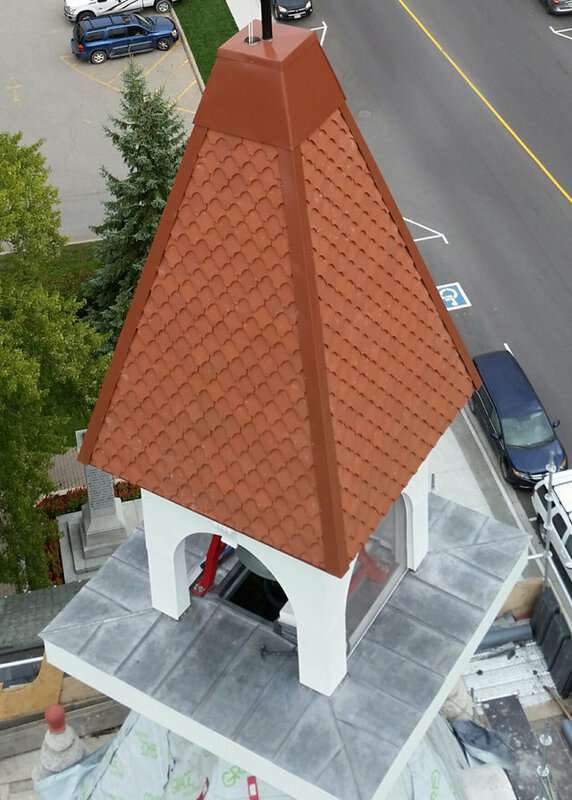 Completed late in 2017, this small job in Canada represents the first export order supplied by Tudor Roof Tiles via our US agent Century Imports..
Romney Red ornamental tiles, in the fishtail design, look stunning on the bell tower. Many thanks to our agent Jim at Century Imports and our very own Ian Whaley and Will McGinnis for making it happen. The Wildlife and Countryside Act 1981 (WCA) protects bats and their roosts in England, Scotland and Wales. Some parts have been amended by the Countryside and Rights of Way Act 2000 (CRoW) which applies only in England and Wales, and by the Nature Conservation (Scotland) Act 2004. The Conservation of Habitats and Species Regulations 2012 consolidate all the various amendments made to the Conservation (Natural Habitats, &c.) Regulations 1994 in respect of England and Wales. The 1994 Regulations transposed Council Directive 92/43/EEC on the conservation of natural habitats and of wild fauna and flora (EC Habitats Directive) into national law. The Regulations provide for the designation and protection of ‘European sites’, the protection of ‘European protected species’, and the adaptation of planning and other controls for the protection of European sites. All bats are listed as ‘European protected species of animals’. Intentionally or recklessly disturb bats, where that disturbance may affect the ability of those bats to survive, breed, rear or nurture their young, or is likely to significantly impact on the local distribution or abundance of any bat species, whether in a roost or not. Damage or destroy a place of shelter (roost) of a bat, be that a resting or breeding place — regardless of whether bats are present or not. Possess a bat, whole or in part, alive or dead. Obstruct access to a roost. How do bats affect my planning application? The consideration of protected species is key to the determination of a development proposal and as such, bat surveys may need to be carried out, along with any mitigating measures, to the satisfaction of the local planning authority. Otherwise, the planning application will be refused. In some cases bat survey/mitigation measures will be enforced as a condition of planning approval (and noted on the approval document). Local authorities are obliged as part of their local planning policies to ensure the conservation of biodiversity, including bats and other species protected under the European Habitats Directive. As a result, they need to assess every planning application against this criteria and will make a judgement on your application. However, you will only need to undertake a survey if there is a ‘reasonable likelihood’ of bats being present. What development constitutes a ‘reasonable likelihood’? The Association of Local Government Ecologists (ALGE) has produced a trigger list of development types that require a bat survey. In many cases local authorities have produced their own version of this list. In your local authority’s local plan, it will likely be referred to as ‘planning application validation requirements’ or ‘validation requirements for biodiversity’. The ALGE list is as below. 7. Any development proposals involving a wind turbine. Note that most planning authorities have their own validation requirements which will be specific about the requirements for each type of planning application. In most cases, wording is based around ‘conversion of redundant buildings’ or similar, along with the inclusion of other specific development types. The conclusion? Check with your local planning authority first and be aware that if the building you’re converting or renovating is currently empty, you’re likely to need a survey — along with any site close to woodland and/or water. If your scheme falls under this criteria, you will need to commission a preliminary bat survey (typical cost: £300) and, unless that provides evidence of a low potential for bat presence, a full bat survey (typical cost £1,000+) and report on how your scheme will allow for bats. The conversion of agricultural buildings into dwellings has been included as a special class within Permitted Development (PD) rights legislation, meaning that they can be converted into homes without the need for planning approval (as long as certain specific criteria are met). Planning permission is not required as long as the local authority is given chance to assess the scheme against specific issues, e.g. design and materials used, impact on highways and so on. These so-called ‘prior approval’ criteria do not include ecology and specifically bat preservation issues, although, as conservancy of protected species is required under the law, would-be PD barn converters will still need to undergo the same process if they suspect the presence of bats. When are you More Likely to Have Bats? Two ‘F’ words and two ‘W’ words are key here: foraging, flightlines, woodland and water. The two sets of words are, of course, related, and a survey will provide a likelihood of bats being present on a site given its value to them. Bats like broadleaf woodland, tree-lined watercourses and grazed parkland (just to be clear, they like to drink water and eat insects). Even more so, they like features that help them to ‘commute’, such as river valleys or hedgerows. If there are caves or tunnels in the local area, then that’s likely to make the site more valuable. If there are lines of trees, that’s good, too. Less likely scenarios for bats are areas without water, isolated habitats such as lone trees, and the lack of presence of features listed above. buildings close to good foraging. When Should Bat Surveys Be Carried Out? Good planning is the key — as part of the early design stage of your project (definitely before you come to think about submitting planning drawings) you should find out whether or not a survey is required. Given the long lead-in time for most domestic building projects (design, planning permission, finding builders, etc. ), in most cases a bat survey ‘season’ can be accommodated into the schedule. Bats tend to hibernate between November and March so activity surveys will need to be carried out as the bats become more active between May and October. However, the publication Bat Surveys: Good Practice Guidelines (available from the Bat Conservation Trust) provides much more detailed information, as the best season to conduct a survey tends to vary depending on a range of factors such as location. The bulk of the survey work should be done during daylight hours in order to establish the location of roosts, droppings, carcasses, and so on. Who Should Carry Out My Bat Survey? Bat surveys should be carried out by a licensed ecologist — otherwise they are likely to be refused by the local authority. The surveyor will follow the guidance laid out in Bat Surveys: Good Practice Guidelines. Licenses are managed by Natural England (in England), Scottish Natural Heritage (in Scotland), Natural Resources (Wales) or the Northern Ireland Environment Agency. You should check to see that the bat surveyor you contract has the relevant licenses (if in doubt, check with the managing organisation). Think of bat surveys in two parts. Firstly, a preliminary survey to assess whether there is any likelihood of bats being present. This is essentially a scoping exercise and consists of two elements: a desk-based data survey and a walkaround. Unless this survey conclusively dismisses the possibility of bats, a full survey (also known as an activity survey) is carried out. The surveys should be carried in accordance with the Bat Surveys: Good Practice Guidelines (available to read in full – as well as in a more friendly version including further advice on surveys – on the Bat Conservation Trust website). An awful lot of information can be gleaned from public resources. First of all, the survey will map relevant recorded presence of bats in the area. The ‘area’ in this case is the site and curtilage itself. Most bat species travel up to 10km and in the case of residential development, it is important to map any noted presence to this extent, with specific interest in the immediate 1km. Your surveyor will research national and locally held databases (perhaps even getting in touch with local bat groups) to assess presence. This data should also include details of woodland and watercourses, ponds, etc. This information will be contextualised as to the habits of particular species most likely to be in the area. Surveyors are looking for potential for roosts, evidence of actual roosts and, of course, evidence of bats themselves on site. The type of building and, in particular, the roof space will be of interest with the surveyor taking note of deviances in the roof tiles, felt, or any other potential entry points. Again, the type of building considered of ‘high value’ to bats depends on the type of bat. Pipistrelles like crevices to dwell in; long-eared species tend to like large open roof spaces. Most likely the surveyor will set up bat detectors – which can be left unattended over several days and nights to record any bat calls – to assess activity. One point worth mentioning: most surveyors suggest that the presence of large cobwebs in the building – while upsetting to those who shudder at the thought of spiders – is an indicator of a lack of bat presence. Droppings – bat droppings will crumble when rubbed between your fingers. Also, of course, they can be found on walls or in cobwebs, whether those supplied by other species are not. Feeding remains – bats like insects but tend to be less fussed about their wings. Large accumulations of wings mean there are more likely to be bats. No cobwebs – a lack of cobwebs means bats might be stopping their propagation, particularly if no evidence can be found of nesting birds. Smell – bats have an identifiable odour (a charming mix of ammonia and mustiness). Scratching and tracks – physical evidence of marks around access points and in dust. If the preliminary assessments indicate the possibility of bats, then an activity survey is usually the next step. The surveyor recommends the best time to carry out the survey (e.g. between May and August), at dusk and dawn — often on more than one occasion, on a dry day. These surveys have to be carried out by licensed bat workers and the period of time the site is surveyed for varies with the likelihood of bats and the scope of the initial proposal (the so-called transect effort index). These activity surveys, which include the use of infra-red cameras, hand-held bat detectors, unattended fixed bat detectors (which can record sound for three consecutive days and nights), and even radars, are likely to cost in the region of £1,000. The full survey will present data that details the activity and presence of bats through, for example, the number of passes, by the type of species, and at a particular location. This survey will need to be submitted with the full planning application for the scheme along with a Conservation Report on Measures (Mitigation, Compensation and Enhancement). Your proposal is not one of the triggering development schemes outlined by your local authority. Your preliminary bat surveyhas found a low potential to support bats (with evidence to back this up). You have word from the local authority that there is no need to carry out a full survey. mitigation work, which minimises the impact of the development on bats, does not usually need a European Protected Species (EPS) licence — although, to complicate matters, it may do. Licenses are administered by Statutory Nature Conservation Organisations — the main basis for refusal is that an alternative measure could be proposed that has a less significant impact on bats. To apply for a licence (and therefore avoid prosecution), you will need to have demonstrated sophisticated mitigation or compensation proposals. Whether work is considered to be mitigation or compensation depends on its scope and the impact it has on the roost. 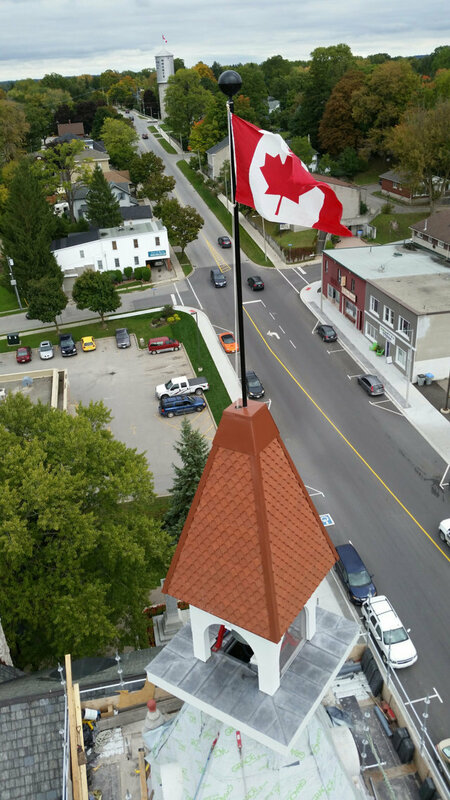 For example, a re-roofing project will be considered mitigation if the work is proposed outside of the roosting season, the roof void itself will be replaced as it is, along with any access points being replaced in the same position. A scheme that replaces roof timbers or changes the location of any roof access points will be considered compensation (and therefore require a license in order to avoid prosecution). Usually, the re-roofing of a building will demand formalised new access measures to replace those that exist, informally, already. Typically these would involve specially designed roof and ridge tiles with raised elements built in to allow access — usually known as bat access sets, which consist of three tiles (including a ridge) all slightly raised to allow air movement and, of course, access. The type of measure you end up with will have to be based on the requirements of the bats you are suspected to be sharing your new home with. Their access points and any ‘bat home’-style products will need to be based on their requirements. The more elaborate measures come when roosts are moved. Mitigation would then involve the creation of a newly built roost which, as a visual reference, might not be unlike a rather fancy shed — perhaps bigger. In many cases, these would need to be heated and insulated and built to rather specific constructional guidelines. The cost implication is all too significant (often running into the low £1,000s), but cannot be avoided. Details of these design proposals will need to be outlined in the Conservation Report, usually involving sketches of the new locations of access points and design details (e.g. 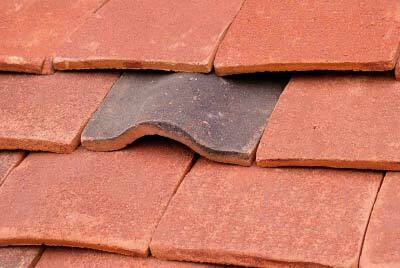 ridge tiles, bat access roof tiles to be used, etc.). If you want to show that you are compliant with mitigation, you will need to ensure the Continued Ecological Functionality (CEF) of the site. The actual type of measure will depend on the type of bat found. 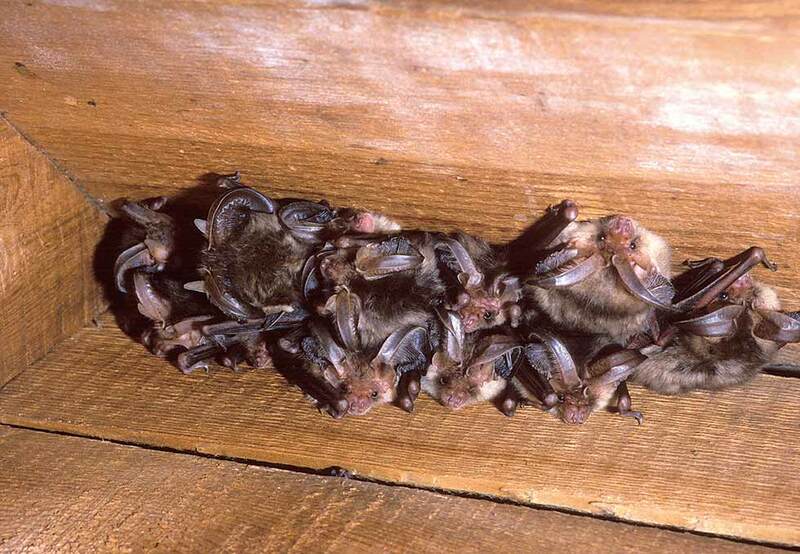 An occasional roost used by a single male pipistrelle offers a much easier scenario than a maternity colony of long-eared bats — which rather than the off-the-shelf items described above is likely to require a dedicated new space such as the dreaded bat attic, which could be up to 6m high. The best course of action – particularly for those needing to go down the route of getting licenced work – is to check out expert guidance websites. Above: The Habibat is a specially-built large, solid bat box made of concrete with an internal roost space. 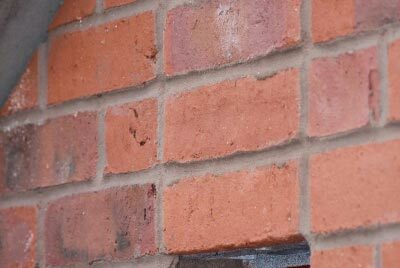 It can be incorporated into the fabric of the building and clad in brick, stone, timber and more. Architect Darren Bray (from PAD Studio) alerted us to a new issue on bat-affecting projects he has been involved with in recent months — the breather membrane. New research carried out at the University of Reading, in partnership with the Bat Conservation Trust, has shown that bats can become entangled in traditional woven breather membranes in roofs. As a result, the only material considered safe for bats at present is bitumen type 1F felt — a requirement increasingly having to be accommodated in new designs. A home for a bat is called a roost. These are largely temporary shelters, but it’s important to identify the type of roost you are dealing with as it will have an impact on the way you deal with bats in your design. Maternity Roosts — in the summer, female bats will need somewhere warm to rear their young (they only tend to give birth once a year). Typical temperatures for a maternity roost are between 30-40?C. Male bats will have their own roosts which are a bit cooler. Hibernation Roosts — bats hibernate in winter and as a result tend to require less warmth in their hibernation roosts. The roost you build (which should be covered by a European Protected Species licence) will depend on the type of bats you have. The design of the roost will need to allow for entry points, a flying area and – if the type of bat is roof-dwelling (as opposed to crevice-dwelling) – some roof timbers. You might even need to insulate the roost in order to minimise temperature fluctuations.